Network Performance Monitor detects network issues like traffic blackholing, routing errors, and issues that conventional network monitoring methods aren't able to detect. The solution generates alerts and notifies you when a threshold is breached for a network link. It also ensures timely detection of network performance issues and localizes the source of the problem to a particular network segment or device. Performance Monitor: You can monitor network connectivity across cloud deployments and on-premises locations, multiple data centers, and branch offices and mission-critical multitier applications or microservices. With Performance Monitor, you can detect network issues before users complain. Service Connectivity Monitor: You can monitor the connectivity from your users to the services you care about, determine what infrastructure is in the path, and identify where network bottlenecks occur. You can know about outages before your users, and see the exact location of the issues along your network path. This capability helps you perform tests based on HTTP, HTTPS, TCP, and ICMP to monitor in near real time or historically the availability and response time of your service. You also can monitor the contribution of the network in packet loss and latency. With a network topology map, you can isolate network slowdowns. You can identify problem spots that occur along the network path from the node to the service, with latency data on each hop. With built-in tests, you can monitor network connectivity to Office 365 and Dynamics CRM without any preconfiguration. With this capability, you can monitor network connectivity to any TCP-capable endpoint, such as websites, SaaS applications, PaaS applications, and SQL databases. ExpressRoute Monitor: Monitor end-to-end connectivity and performance between your branch offices and Azure, over Azure ExpressRoute. More information on the various capabilities supported by Network Performance Monitor is available online. The list of supported regions for ExpressRoute Monitor is available in the documentation. Use the basic processes to install agents at Connect Windows computers to Azure Monitor and Connect Operations Manager to Azure Monitor. Performance Monitor: Install Log Analytics agents on at least one node connected to each subnetwork from which you want to monitor network connectivity to other subnetworks. To monitor a network link, install agents on both endpoints of that link. If you're unsure about the topology of your network, install the agents on servers with critical workloads between which you want to monitor the network performance. For example, if you want to monitor the network connection between a web server and a server running SQL, install an agent on both servers. Agents monitor network connectivity (links) between hosts, not the hosts themselves. Service Connectivity Monitor: Install an Log Analytics agent on each node from which you want to monitor the network connectivity to the service endpoint. An example is if you want to monitor network connectivity to Office 365 from your office sites labeled O1, O2, and O3. Install the Log Analytics agent on at least one node each in O1, O2, and O3. ExpressRoute Monitor: Install at least one Log Analytics agent in your Azure virtual network. Also install at least one agent in your on-premises subnetwork, which is connected through ExpressRoute private peering. Network Performance Monitor uses synthetic transactions to monitor network performance between source and destination agents. You can choose between TCP and ICMP as the protocol for monitoring in Performance Monitor and Service Connectivity Monitor capabilities. Only TCP is available as the monitoring protocol for ExpressRoute Monitor. Make sure that the firewall allows communication between the Log Analytics agents used for monitoring on the protocol you choose. TCP protocol: If you choose TCP as the protocol for monitoring, open the firewall port on the agents used for Network Performance Monitor and ExpressRoute Monitor to make sure that the agents can connect to each other. To open the port, run the EnableRules.ps1 PowerShell script without any parameters in a PowerShell window with administrative privileges. The script creates registry keys required by the solution. It also creates Windows Firewall rules to allow agents to create TCP connections with each other. The registry keys created by the script specify whether to log the debug logs and the path for the logs file. The script also defines the agent TCP port used for communication. The values for these keys are automatically set by the script. Don't manually change these keys. The port opened by default is 8084. You can use a custom port by providing the parameter portNumber to the script. Use the same port on all the computers where the script is run. The script configures only Windows Firewall locally. If you have a network firewall, make sure that it allows traffic destined for the TCP port used by Network Performance Monitor. You don't need to run the EnableRules.ps1 PowerShell script for Service Connectivity Monitor. Add the Network Performance Monitor solution to your workspace from the Azure marketplace. You also can use the process described in Add Azure Monitor solutions from the Solutions Gallery. Open your Log Analytics workspace, and select the Overview tile. 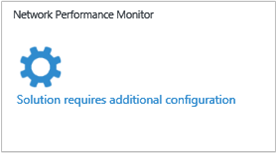 Select the Network Performance Monitor tile with the message Solution requires additional configuration. On the Setup page, you see the option to install Log Analytics agents and configure the agents for monitoring in the Common Settings view. As previously explained, if you installed and configured Log Analytics agents, select the Setup view to configure the capability you want to use. Performance Monitor: Choose the protocol to use for synthetic transactions in the Default Performance Monitor rule, and select Save & Continue. This protocol selection only holds for the system-generated default rule. You need to choose the protocol each time you create a Performance Monitor rule explicitly. You can always move to the Default rule settings on the Performance Monitor tab (it appears after you complete your day-0 configuration) and change the protocol later. If you don't want the Performance Monitor capability, you can disable the default rule from the Default rule settings on the Performance Monitor tab. 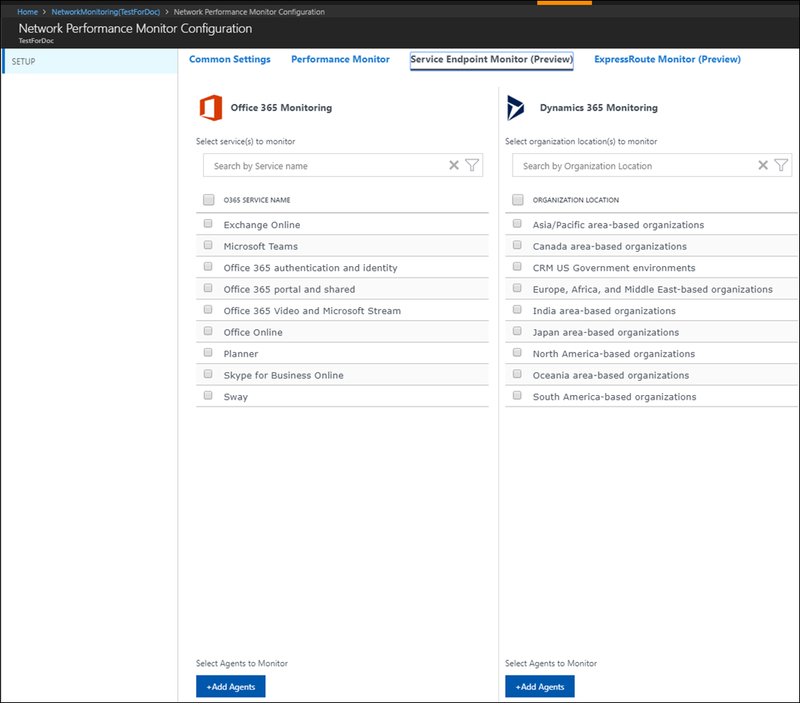 Service Connectivity Monitor: The capability provides built-in preconfigured tests to monitor network connectivity to Office 365 and Dynamics 365 from your agents. Choose the Office 365 and Dynamics 365 services that you want to monitor by selecting the check boxes beside them. To choose the agents from which you want to monitor, select Add Agents. If you don't want to use this capability or want to set it up later, don't choose anything and select Save & Continue. ExpressRoute Monitor: Select Discover Now to discover all the ExpressRoute private peerings that are connected to the virtual networks in the Azure subscription linked with this Log Analytics workspace. After the discovery is finished, the discovered circuits and peerings are listed in a table. The monitoring for these circuits and peerings is initially in a disabled state. Select each resource that you want to monitor, and configure monitoring for them from the details view on the right. Select Save to save the configuration. To learn more, see the "Configure ExpressRoute monitoring" article. After the setup is finished, it takes 30 minutes to an hour for the data to populate. While the solution aggregates data from your network, you see the message Solution requires additional configuration on the Network Performance Monitor Overview tile. After the data is collected and indexed, the Overview tile changes and informs you of your network health in a summary. You then can edit the monitoring of the nodes on which Log Analytics agents are installed, as well as the subnets discovered from your environment. All subnets with at least one agent installed are listed on the Subnetworks tab on the configuration page. Select or clear the check box next to the subnetwork ID. Then make sure that Use for Monitoring is selected or cleared, as appropriate. You can select or clear multiple subnets. When disabled, subnetworks aren't monitored, and the agents are updated to stop pinging other agents. Choose the nodes that you want to monitor in a particular subnetwork. Select the subnetwork from the list, and move the required nodes between the lists that contain unmonitored and monitored nodes. You can add a custom description to the subnetwork. All the nodes that have an agent installed on them are listed on the Nodes tab. Select or clear the nodes that you want to monitor or stop monitoring. Select Use for Monitoring, or clear it, as appropriate. To collect loss and latency information, Network Performance Monitor uses TCP SYN-SYNACK-ACK handshake packets when you choose TCP as the protocol. Network Performance Monitor uses ICMP ECHO ICMP ECHO REPLY when you choose ICMP as the protocol. Trace route is also used to get topology information. The following table shows data collection methods and other details about how data is collected for Network Performance Monitor. The solution uses synthetic transactions to assess the health of the network. Log Analytics agents installed at various points in the network exchange TCP packets or ICMP Echo with one another. Whether the agents use TCP packets or ICMP Echo depends on the protocol you selected for monitoring. In the process, agents learn the round-trip time and packet loss, if any. Periodically, each agent also performs a trace route to other agents to find all the various routes in the network that must be tested. Using this data, the agents can deduce the network latency and packet loss figures. The tests are repeated every five seconds. 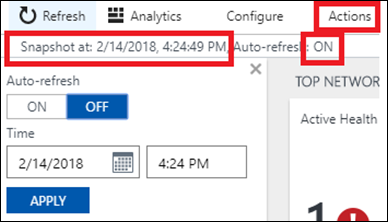 Data is aggregated for about three minutes by the agents before it's uploaded to the Log Analytics workspace in Azure Monitor. Although agents communicate with each other frequently, they don't generate significant network traffic while conducting the tests. Agents rely only on TCP SYN-SYNACK-ACK handshake packets to determine the loss and latency. No data packets are exchanged. During this process, agents communicate with each other only when needed. The agent communication topology is optimized to reduce network traffic. After you enable the Network Performance Monitor solution, the solution tile on the Overview page provides a quick overview of the network health. Top Network Health Events: This page provides a list of the most recent health events and alerts in the system and the time since the events have been active. A health event or alert is generated whenever the value of the chosen metric (loss, latency, response time, or bandwidth utilization) for the monitoring rule exceeds the threshold. ExpressRoute Monitor: This page provides health summaries for the various ExpressRoute peering connections the solution monitors. The Topology tile shows the number of network paths through the ExpressRoute circuits that are monitored in your network. Select this tile to go to the Topology view. Service Connectivity Monitor: This page provides health summaries for the different tests you created. The Topology tile shows the number of endpoints that are monitored. Select this tile to go to the Topology view. Performance Monitor: This page provides health summaries for the Network links and Subnetwork links that the solution monitors. The Topology tile shows the number of network paths that are monitored in your network. Select this tile to go to the Topology view. Common Queries: This page contains a set of search queries that fetch raw network monitoring data directly. You can use these queries as a starting point to create your own queries for customized reporting. You can select various links on the solution dashboard to drill down deeper into any area of interest. For example, when you see an alert or an unhealthy network link appear on the dashboard, select it to investigate further. A page lists all the subnetwork links for the particular network link. You can see the loss, latency, and health status of each subnetwork link. You can quickly find out which subnetwork link causes problems. Select View node links to see all the node links for the unhealthy subnet link. Then, you can see individual node-to-node links and find the unhealthy node links. Select View topology to view the hop-by-hop topology of the routes between the source and destination nodes. The unhealthy routes appear in red. You can view the latency contributed by each hop so that you can quickly identify the problem to a particular portion of the network. Each view displays a snapshot of your network health at a particular point in time. By default, the most recent state is shown. The bar at the top of the page shows the point in time for which the state is displayed. To view a snapshot of your network health at a previous time, select Actions. You also can enable or disable auto-refresh for any page while you view the latest state. At each level that you drill down, you can see the trend of the applicable metric. It can be loss, latency, response time, or bandwidth utilization. To change the time interval for the trend, use the time control at the top of the chart. Trend charts show you a historical perspective of the performance of a performance metric. Some network issues are transient in nature and are hard to catch by looking at only the current state of the network. Issues can surface quickly and disappear before anyone notices, only to reappear at a later point in time. Such transient issues also can be difficult for application administrators. The issues often show up as unexplained increases in application response time, even when all application components appear to run smoothly. You can easily detect these kinds of issues by looking at a trend chart. The issue appears as a sudden spike in network latency or packet loss. To investigate the issue, use the Network State Recorder control to view the network snapshot and topology for that point in time when the issue occurred. Network Performance Monitor shows you the hop-by-hop topology of routes between the source and destination endpoint on an interactive topology map. To view the topology map, select the Topology tile on the solution dashboard. You also can select the View topology link on the drill-down pages. The topology map displays how many routes are between the source and destination and what paths the data packets take. The latency contributed by each network hop is also visible. All the paths for which the total path latency is above the threshold (set in the corresponding monitoring rule) are shown in red. When you select a node or hover over it on the topology map, you see the node properties, such as FQDN and IP address. Select a hop to see its IP address. You can identify the troublesome network hop by noticing the latency it contributes. To filter particular routes, use the filters in the collapsible action pane. To simplify the network topologies, hide the intermediate hops by using the slider in the action pane. You can zoom in or zoom out of the topology map by using your mouse wheel. The topology shown in the map is layer 3 topology and doesn't contain layer 2 devices and connections. All data that is exposed graphically through the Network Performance Monitor dashboard and drill-down pages is also available natively in log queries. You can perform interactive analysis of data in the repository and correlate data from different sources. You also can create custom alerts and views and export the data to Excel, Power BI, or a shareable link. The Common Queries area in the dashboard has some useful queries that you can use as the starting point to create your own queries and reports. 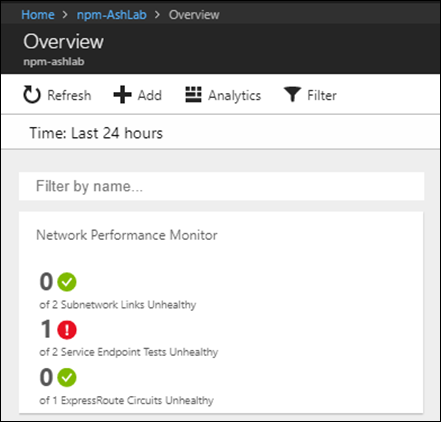 Network Performance Monitor uses the alerting capabilities of Azure Monitor. This means that all notifications are managed using action groups. You will see a link that will redirect you to Azure portal. Click it to access the portal. Click the Network Performance Monitor solution tile. Select the test you want to create an alert on and follow the below mentioned steps. You can choose to enter your email directly or you can choose to create alerts via action groups. If you choose to enter your email directly, an action group with the name NPM Email ActionGroup is created and the email id is added to that action group. If you choose to use action groups, you will have to select an previously created action group. You can learn how to create an action group here. Once the alert is successfully created, you can use Manage Alerts link to manage your alerts. Each time you create an alert, NPM creates a query based log alert rule in Azure Monitor. This query is triggered every 5 mins by default. Azure monitor does not charge for the first 250 log alert rules created, and any alert rules above the 250 log alert rules limit will be billed as per Alerts pricing in Azure Monitor pricing page. Notifications are charged separately as per Notifications pricing in Azure Monitor pricing page. Information on pricing is available online. UserVoice: You can post your ideas for Network Performance Monitor features that you want us to work on. Visit the UserVoice page. Join our cohort: We're always interested in having new customers join our cohort. As part of it, you get early access to new features and an opportunity to help us improve Network Performance Monitor. If you're interested in joining, fill out this quick survey. Learn more about Performance Monitor, Service Connectivity Monitor, and ExpressRoute Monitor.